On August 30, 1989, the boiling water reactor (BWR) at the Hope Creek Generating Station in New Jersey automatically scrammed, or rapidly shut down, from 82 percent power, due to low water level in the reactor vessel. The normal water level was approximately midway along the 5-foot height of the steam separators installed inside the reactor vessel above the reactor core (see Figure 1) and about 14 feet above the top of the reactor core. When the water level dropped about two feet below normal, the control rods were automatically inserted to interrupt the nuclear chain reaction and shut down the reactor. The water level in a bath tub depends on the amount of water entering via the faucet and the amount going down the drain. The water level in the bath tub rises when the faucet flow exceeds the drain flow. When the drain flow exceeds the faucet flow, the level drops. When the flows match, the water level remains constant. The water level in a metal pot on a hot stove can rise and fall even with no water being added or removed. As the water within the pot begins to boil, the formation of bubbles causes the water level to rise. The amount of water inside the pot remains the same (or decreases because some water leaves as water vapor), but the volume it occupies increases. Conversely, the water level in a pot of rigorously boiling water drops if the heat is turned down because the number and size of the bubbles decreases. The water level inside the reactor vessel of a BWR like Hope Creek depends on both the inflow/outflow balance of a bath tub and the heat balance of a boiling pot of water. Feedwater flow adds water to the reactor vessel (labeled “FW” on the right side of Figure 1). 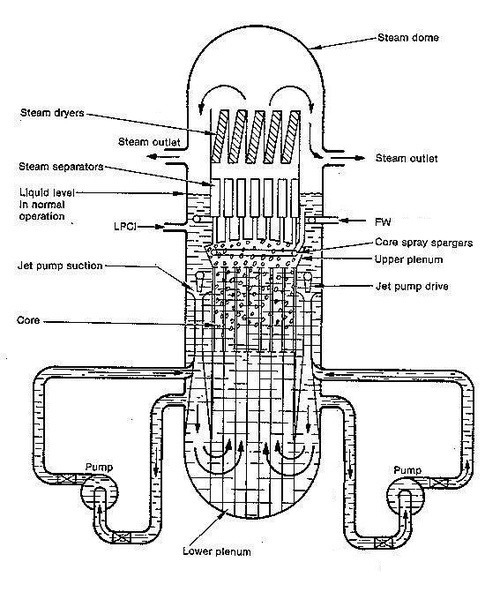 Steam flow removes water from the reactor vessel (labeled “Steam Outlet” on both sides of the figure). A reactor scram on low water level suggests that feedwater flow was less than steam flow. That is the usual reason for low level scrams at BWRs, but not this one at Hope Creek. Feedwater flow essentially matched steam flow before, during, and after the reactor scram. So, what caused the low reactor vessel water level at Hope Creek? Well, it seems that a pipe header supplying air to some of the valves for the control rods broke. The air supply to all 185 control rods then escaped through the broken piping. The air pressure loss allowed the scram inlet and outlet valves for individual control rods to open. These spring-loaded valves are normally kept closed by air pressure and will open when air pressure is lost. Once that happens, that control rod is rapidly inserted into the reactor core. Control rods contain boron, a material which is like glue for neutrons. When the control rods are inserted, neutrons released from fissioning atoms are captured by the boron and cannot interact with other uranium and plutonium atoms to cause more fissions. During a normal reactor scram, electrical signals cause all the scram inlet and outlet valves to open virtually simultaneously. In this Hope Creek event, the timing for the scram inlet and outlet valves opening depended upon their distance from the broken pipe in the air header. The control rod closest to the broken air pipe inserted right away. The next control rod to move did not move until nearly seven seconds later. The last control rod to move did not begin moving until eleven seconds after the pipe broke. Control rods normally move from fully withdrawn to fully inserted within five seconds. Thus, some of the first control rods to move were fully inserted before the lagging control rods even began inserting. The staggered insertion of control rods at Hope Creek during this event caused reactor power to drop quickly. The effect of the rapid power reduction on water level in the reactor pressure vessel is similar to that from lifting a pot of boiling water off a hot stove – the bubbling slows and the level in the pot drops. At Hope Creek, the water level dropped to the scram setpoint. Twenty years later, on May 17, 2009, the Hope Creek BWR again automatically scrammed due to low water level in the reactor vessel. It was almost an exact instant replay of the August 1989 event – an air header pipe ruptured. Air escaping from the ruptured pipe caused the pressure inside the pipe to drop. As the air pressure dropped below spring forces of individual scram inlet and outlet valves, these valves opened allowing individual control rods to insert. The insertion of some control rods rapidly reduced the reactor power level, which rapidly reduced the number of bubbles in the reactor water. The water level dropped below the scram setpoint, triggering an automatic reactor scram. Safety procedures call for the operators to immediately scram the reactor when two or more control rods are moving in the reactor core. It took more than two control rods to be moving in order to to drop the water level down to the automatic scram setpoint. It also took several seconds for the water level to drop low enough to invoke the automatic scram. The requirement to immediately scram the reactor when more than one control rod is moving has significant safety implications. The control rods are moved by hydraulic pistons relying upon differential pressure. One side of the pistons is exposed to high pressure water while the other side is vented to a large volume at atmospheric pressure. If, as in these cases at Hope Creek, some control rods move before the rest get the message, the water vented from the hydraulic pistons of the moving control rods can fill the vent volume. The remainder of the control rods may not move because there is no place for the water vented from their hydraulic pistons to go. As will soon be detailed further in a Fission Story about three failed reactor scrams at Browns Ferry, this scenario is reality rather than speculation. Nuclear reactors are forced to shut down far less frequently now than two decades ago. More often than not, an equipment failure that starts a reactor down the path to an automatic shut down is truncated by the control room operators manually tripping the reactor within seconds. Except at Hope Creek. It’s wonderful that the safety systems automatically functioned at Hope Creek. It would be even better if the operators at Hope Creek conformed to the high levels of performance demonstrated at most other nuclear power plants.